The Summer School in Digital Archaeology has gathered over 20 students and early career researchers from four continents in a week-long intensive training in computational modelling and complexity science. The traditional picture of a Humanities scholar usually invokes a dusty library, curious artefacts or ancient texts. However, a small but rapidly growing group of researchers have embraced cutting edge computational techniques originating from STEM subjects and successfully applied them to long standing questions about human past. Between 10 and 14th of September twenty new adepts received an in depth training in Agent-based Modelling, Network Science, Open Link Data and Data Science. With a mix of seminars describing the theory and practical hands-on tutorials in software (Python, Gephi, Visione, Netlogo, SPARQL) students had a chance to better understand the potential of computational modelling, to get to know the nitty gritty of the methods and to apply them to selected archaeological case studies. In the feedback received after the workshop 66% of participants graded it as outstanding and the majority declared they are intending to use the techniques learnt in their own research. “The approaches taught at the Summer School are the absolute state of the art in terms of computational methods in archaeology and beyond. They will position the students at the cutting edge of archaeological research and complexity science in general.” – commented dr Tom Brughmans from University of Oxford in Great Britain, one of the school’s instructors. The Summer School has brought together a highly diverse set of experts in computational modelling and complexity science: physicists specialising in network science, mathematicians focused on ontologies and knowledge representation, social scientists simulating human societies, computer scientists talking about open science and scientific reproducibility and archaeologists who have been routinely using these techniques in their research. 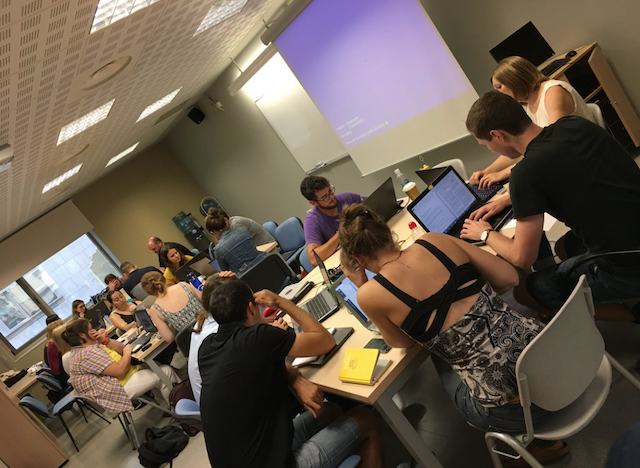 The Summer School in Digital Archaeology was oragnised and coordinated by dr Iza Romanowska from the Barcelona Supercomputing Center. The event has been generously sponsored by the Complex Systems Society, University of Barcelona’s CEIPAC – EPNet Project, Siris Academics, Autonomous University of Barcelona’s Laboratory for Socio Dynamic Simulation, Complexity Lab Barcelona (ClabB), Reds de Excelencia grant and Barcelona Supercomputing Center. For more information about the school see the event website.